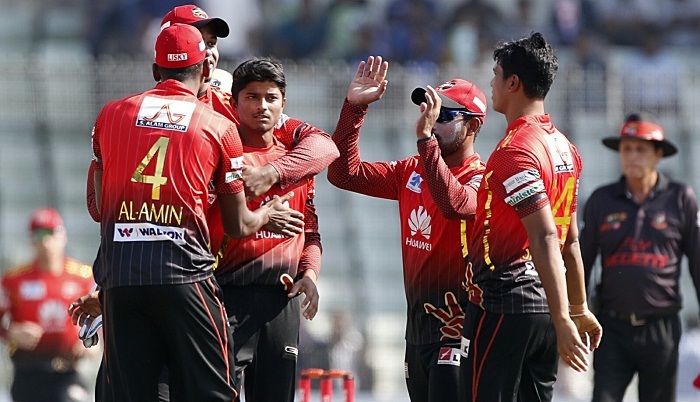 Comilla Victorians secured a dramatic 4-wicket victory in a low-scoring match of AKS BPL 2017 Powered By Shah Cement at Sher-e-Bangla National Cricket Stadium (SBNCS). Batting first Rangpur Riders were bowled out for 97 in 17.1 overs. Brendon McCullum scored the highest knock of 24 as only three Rangpur batsmen managed to score past double digits. Mahedi Hasan bagged 4 wickets for 22. Chasing a small target, skipper Tamim Iqbal gave Comilla Victorians a good start with a knock of 22 off 22 balls. But Rangpur Riders bowlers fought back into the match by picking up couple of quick wickets. In the end Marlon Samuels and Hasan Ali guided Comilla to a 4-wicket victory with 3 balls remaining. Mashrafe Bin Mortaza picked up 3 wickets for 24. Mahedi Hasan was named man of the match. Result: Comilla Victorians won by 4 wickets.